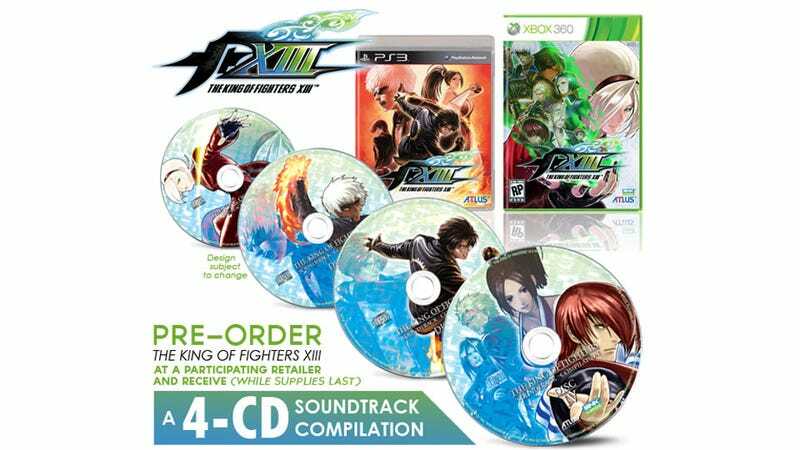 Not content to merely offer its usual single soundtrack CD, Atlus has gathered four discs of fighting music to entice players into putting their money down on The King of Fighters XIII. That's right, four CDs packed with your favorite tunes from The King of Fighters series, including that one theme from that stage with the things, and the song that reminds you of how bouncy Mai is. Listening to these tunes will be like playing the game, only without seeing it or controlling anything. You might be jogging. I don't know. Along with news of the preorder bonus comes word of some of the exclusive game modes coming in the console version of the game. There's a story mode packed with new visuals and animations; a practice mode in order to make perfect; a tutorial mode that teaches newcomers how to fight in a kingly fashion; a challenge mode that tasks players with performing specific actions in specific situations; and of course, online versus. All that, plus four colorful CDs you can put in that dusty old CD case in your closet after you've finished ripping them to MP3. October can't come soon enough!